When decorating your home, you may find that suppliers aren't able to provide a perfect off-the-shelf color to match the room you are working on. Alternatively, you may have a particular color in mind for your room but can't find exactly the right shade to purchase. Many DIY or hardware stores offer a paint-tinting service, but special orders can make the final bill more expensive. 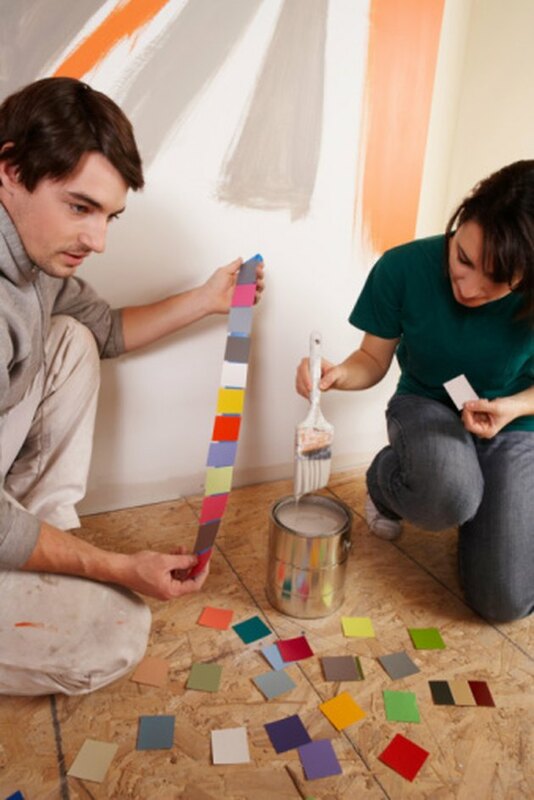 By purchasing a combination of cheaper paints and tinting them yourself, you can save money while achieving the perfect wall or ceiling finish. Use color swatches to identify your base color. Obtain a variety of color swatches from your local DIY or hardware store. If you are trying to match an existing color, you will need to find the closest possible shade of color from those available on the swatch color range. Remember that it is better to choose a shade that is slightly darker than the one you want whenever possible. Dark colors have a higher pigment content and can be lightened more easily. Use your swatches to find the change in shade that your base color will need to undergo. If you simply want a lighter color, you will need to tint your base selection with white paint. The addition of a dark tint will cause the base color to gray slightly. The addition of the three primary colors (red, blue and yellow) will alter the color and shade of the paint. The primary colors can be used to produce greener or more orange effects, but are more difficult to achieve perfectly. Purchase enough of your chosen base color to cover the walls or ceiling of the room you are working on. Additionally, you will need to purchase approximately one-fifth of the volume of the base color in your desired tint. You may need to use two or three different tints for some shades, although this will make the mixing process more difficult. Remove the lids from the cans of paint and stir thoroughly. Take an empty can and pour a small quantity of base color inside. Take the tint and add several drops to the poured base color and stir the two together thoroughly. Lift the paint stirring stick from the can and hold it up to the light to see if the correct shade has been achieved. Continue adding additional quantities of tint until the base color has been changed to your preferred shade. This will serve as an indication of how much tint color you will need to add to the base color when you are ready to start painting. Add the tint color to the base color in small quantities as soon as you are ready to begin work. Add the tint a little at a time, keeping in mind that it is better to put in too little tint color than too much. Stir the paints together after each addition of tint color until the correct shade has been achieved. Remember to store any surplus paint for use at a later stage to guarantee a perfect match on any future work. What Colors Do You Mix Together to Make the Color Eggplant?